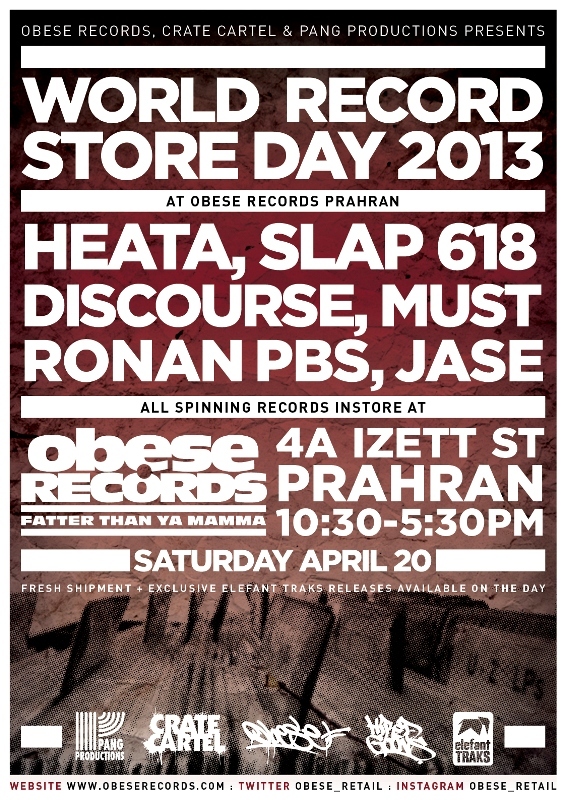 Elefant Traks has teamed up with Obese Records (Prahran) on RSD with an exclusive offer. Purchase Hermitude’s Parallel Paradise remix EP and Urthboy’s Smokey’s Homies Remix EP and receive a FREE Elefant Traks t-shirt. this deal is exclusive to our Prahran store and only available on RSD. Get in quick as stock is limited. Hermitude’s Parallel Paradise remix EP is available for the first time on vinyl and features the all-conquering 50,000+ selling Flume Remix of HyperParadise. Hermitude’s phenomenal rise has continued into 2013 when they took out the coveted Australian Music Prize (AMP) for their breakthrough album HyperParadise. The vinyl is limited to 400 copies: 100 clear and 300 black. Urthboy will release the Smokey’s Homies Remix EP. It features Urthboy reimagining? Hungry Kids of Hungary’s ‘Yesterday’s Gone’ as well as a new version of ‘Stories’ featuring? Drapht andMantra. There are remixes from Trials, Jaytee and Trailblazers. It comes off the back of Urthboy’s most stunning album to date, Smokey’s Haunt. His profile keeps rising off the back of the massive Smokey’s Tour and the upcoming national Groovin the Moo tour (plus the odd appearance on QandA).